In honor of Grandparents Day (and because Tom Hiddleston's people told me stop calling them and asking if Tom will do a "hot tub" interview with me) we bring you an interview with Baddie Winkle, beloved badass Twitter granny. You all know her as the 86-year-old 420-friendly, zero fucks-giving, dancing, Gucci down to the socks grandmother, proudly proclaiming she's been "stealing your man since 1928" on Twitter. 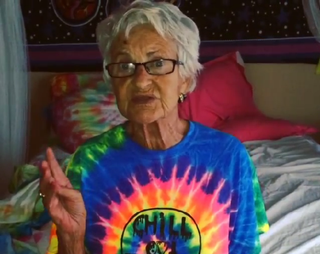 Jezebel life coach Baddie Winkle is the grandmother you always wanted but were secretly afraid might sneak into your room while you were sleeping, steal your car keys and take a joy ride to Tijuana at 4 a.m. with your boyfriend. For those of you who might be concerned, Baddie personally promised me she would not steal my man during our interview (WHEW). The story of how Twitter user Baddie Winkle became an Internet sensation is the stuff of legend (MOVE OVER, PAUL BUNYON AND TAKE YOUR OX WITH YOU). Baddie's granddaughter was in the process of relocating for a new job and didn't want to leave her teenage daughter alone. So Baddie (who has asked that we not use her real name) volunteered to stay with her for a few days. Somewhere during that time, Baddie tried on a few of her teenage great-granddaughter's clothes (including a pair of cutoff shorts). And the rest is pretty much meme-able Internet history. "I didn't have anything else to do that day," she said. "It was kind of warm, she had some cutoffs to cool off." Yeah, when I'm bored I try on relative's clothes. Don't we all? ("So this is what it's like to dress like my aunt. Huh.") When her great-granddaughter saw Baddie's new look, her first thought was to take a picture and get share it with the world. That girl is a goddamn American hero. Baddie said response to her social media posts was instantaneous and definitely overwhelming. "I was amazed. I was absolutely flabberghasted," Baddie said. She currently has more than 260,000 followers on Twitter, 270,000 and counting on Instagram. "I'm being recognized by college and high school kids. They will come up and say are you Baddie Winkle? Can I have a picture taken with you?" "I like the hip hop music to dance to, if it's got a good beat," she said. "It's fun. But I've danced all my life. Since i was a kid, I've always loved to dance. I'm pretty healthy and agile." Of course, she has some advice for how to handle trolls and haters. "There's a lot of people that say bad things [GIRL, DON'T WE KNOW IT] I think a lot of people don't have anything better to do. They need to get a life" she said. "You can't pay attention to them and you just have to shrug it off." About all those 420 jokes, turns out Baddie is not actually a pot smoker. ("It's just a joke," she explained.) But, she is a huge supporter of legalizing marijuana for medicinal purposes. But her life isn't all just laughs and jokes. Baddie said she uses her Twitter posts as a way to take her mind off of family tragedy that struck her several years back. Her husband died 30 years ago, and 15 years ago, she lost her son. She said they would be proud to see her with her fanbase. "Losing your husband and son is the most horrible thing in world. I wouldn't wish it on my worst enemy," she said. "I think of them every day. This helps me get my mind off of them. They both liked to have fun too, they would have loved this. My husband would have said there goes my gal." When she not telling off haters or nominating Beyonce for the ice bucket challenge or doing whatever this is Baddie is at church. If the 420-friendly, man-stealing Twitter granny shows up at your church, you definitely know you found the right congregation. "It gives me something to live by through the week," she said. "I love the singing, the minister's sermons. I just love going to church." "I wish all of you who are grandchildren would call your grandparents on Grandparent's Day," she said. "That would make a lot of grandparents very happy." Image via Baddie Winkle Instagram.